Rama*, 18, went as far as making two dangerous journeys across conflict lines to continue her education; once to sit for Grade 9 exams and again this year to sit for national Grade 12 exams. Aleppo, Syrian Arab Republic, 6 June 2017- My pursuit for education has been a hard and long route. I was in Grade 8 when I was forced to leave school, after fighting started in my village in eastern rural Aleppo. I was depressed but I tried not to lose hope. I continued studying alone at home hoping that I would be able to sit for Grade 9 exams and complete basic education. 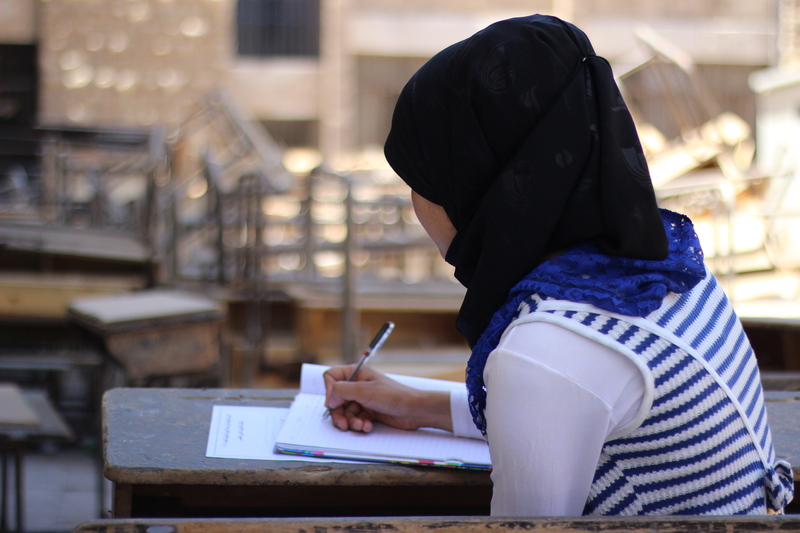 Schools in my village had closed down, so later that year my family and I decided to move to Raqqa in north-eastern Syria so that my siblings and I can continue our education. But every time I found a glimmer of hope for a better future, this war would prove me wrong. Extremist groups took over the city of Raqqa only two months after we moved in, shutting down schools and imposing restraints on education, especially for girls. My friends and I had to study for exams in secret but we managed to travel to Deir-ez-Zor the day before the exams. The trip was difficult. We had to cross several checkpoints and a river on foot, but that didn’t matter. What mattered is that the determination to follow my dreams and my parents’ encouragement won over fatigue and hopelessness. I passed Grade 9 exams, my happiness was beyond words. We even managed to return to our home in rural eastern Aleppo! But the cycle of violence and displacement continued. Whenever there was fighting close to our home, we would leave with our neighbours in the middle of the night to open fields or neighbouring villages. We ran for our safety only with the clothes on our backs. I always remembered to take my Grade 9 certificate with me. You see, it’s the most valuable thing I own; without it, I would not have been able to continue my education. Fighting would later recede and we would return home, only for it to start again. Even during times of relative security, I couldn’t bear life without school. Some of my friends had fled while others had to work, but my friend Fatima and I kept studying at home. We knew that one day it would all pay off and it did. A school reopened in my home town, only six months before the Grade 12 exams started. The suffering did not end here. My younger brother got sick as fighting broke out in our home town, and with no medical attention available, he died. Despite all the difficulties I experienced, I kept moving. I had one dream to fulfil: complete my secondary education and get the certificate to allow me continue further. When the time for official exams came, we had to come to Aleppo since there are no exam centres in my village. The journey that used to take one hour before the war, took us now almost 10. I was scared and exhausted but I was also happy being one step closer to my dream of becoming a doctor one day. I have made new friends here at the accommodation centre. We have meals together, attend remedial classes and do everything together. We have so much in common; we share the same background and difficulties. We help and support each other, we became like one big family! I am sad for all the girls who could not make the trip to sit for exams like I did. They must believe in themselves, and they must continue their education despite the hardships. Everything will pass, as long as you fight for your education. This year, UNICEF-supported 10,689 boys and girls to cross conflict lines from hard-to-reach and besieged areas to sit for national Grade 9 and Grade 12 exams in Syria. UNICEF provided children with bursaries to cover their daily allowance and transportation fees as well as safe accommodation. UNICEF also organized remedial classes to help children revise before exams and psychosocial support sessions to help them cope with the trauma they have witnessed.